TVonics DTR-Z500HD review | What Hi-Fi? It’s only when you see the Freeview+HD logo adorning the front of the unassuming TVonics DTR-Z500HD you get an inkling of what lies beneath – for this is a fully fledged PVR. 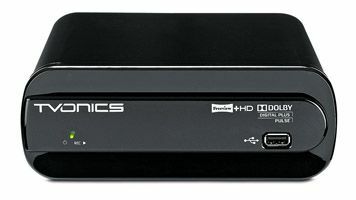 TVonics has crammed twin Freeview HD tuners and a 500GB HDD into a chassis less than 20cm wide (although it means there’s no display to show the channel you’re on). USB inputs on the front and back panels allow software updates and photo slide shows, but you can’t stream video files, which is a bit of a shame. The ethernet socket is for software updates only. Power up the PVR and you’re greeted with an eight-day EPG. The layout is easy to navigate and setting recordings is simple. If shows are also available in HD, or can be series-linked, the box flags this up. The overall user experience is engaging enough, but not quite as intuitive as rival PVRs such as the Humax HDR-FOX T2. The ‘auto’ resolution setting insists on matching that of your TV – so if it’s Full HD, the PVR will always upscale the picture. It’s worth seeing if you prefer the PVR or TV doing the work. We preferred the latter. Detail is very good with stationary images, and edges are crisp even when switching from HD to standard-def. Colours are bold (if a tad unnatural), and the picture also displays a few visible digital artifacts, but it’s by no means unwatchable. The sound (the box can output Dolby 5.1 when needed) is fine, but can get a little lively. Though not perfect, the little TVonics box could be useful if you want something to shoehorn into a small space in your AV rack or use in a second room.